Cherry trees make up the genus Prunus, where more than 200 different species of trees and shrubs exist. Characterized by their showy, ethereal blooms, cherry trees have five-petaled flowers that range in color from white and pale pink to red and magenta. The foliage on cherry tree often has a toothed edging and the round, birds enjoy mouth-watering fruits. Cherry trees require moist, well-drained soil with a moderate amount of fertility. Sargent cherry (Prunus sargentii) is a deciduous cherry tree with rapid growth rate and medium texture. Growing 20 to 40 feet tall and wide, Sargent cherries have an upright, rounded form. The shiny dark green leaves on Sargent cherry trees grow 2 to 5 inches long with new foliage emerging with a red tinge. In fall the leaves change to an orange and red color for a vibrant display to the garden. Beginning in spring the single, pink to dark pink flowers emerge. Growing on 1-inch long pedicels the flowers grow up to 1-½ inches wide. Easy to transplant, the bark on Sargent cherry trees is a rich, red to chestnut brown. Sargent cherry trees cast dense shade down upon the garden and are an ideal tree to plant as a specimen tree for a vibrant focal point. Sargent cherry trees grow best in full sun and well-drained soils. Plant Sargent cherry trees in U.S. Department of Agriculture (USDA) Hardiness Zones 4 to 7. Fire cherry (Prunus pennsylvanica) is a deciduous cherry tree variety with a rapid growth rate. Growing 25 to 40 feet tall, fire cherry trees have an open, rounded crown with horizontal branches. The oval green leaves on fire cherry trees grow 3 to 4 ½ inches wide to turn a maroon, orange, and red in fall. The spring-blooming flowers grow in clusters of white panicles with the red fruit to follow in summer. Fire cherry trees grow best in full sun and a wide range of soil varieties. They do not tolerate shade. Plant the fire cherry in USDA Hardiness Zones 3 to 7. Higan cherry (Prunus subhirtella) is a deciduous tree with a moderate growth rate and upright, spreading form. Growing 20 to 40 feet tall and 15 to 30 feet wide, Higan cherry trees are one of the longest-lived cherry tree varieties. Beginning in early spring, the white-to-pink flowers emerge and grow ½ inch wide. The leaves on Higan cherry trees grow 1 to 4 inches long and turn yellow in fall. Higan cherry trees require full sun and moist, well-drained soils to thrive. They tolerate heat and clay soil. 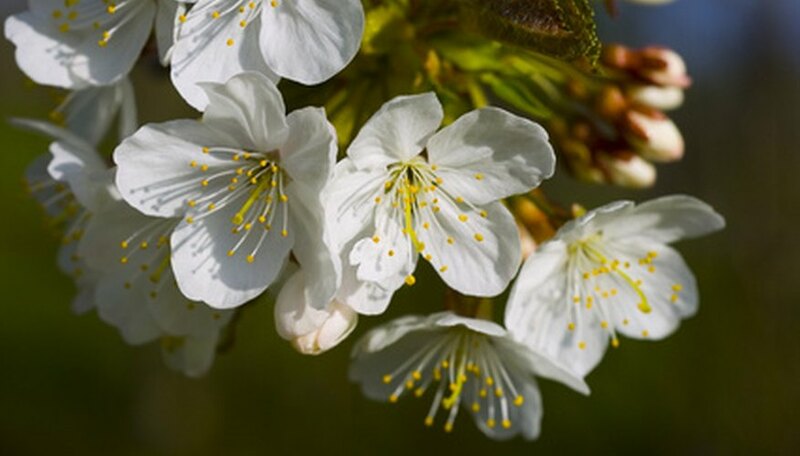 Plant the Higan cherry tree in USDA Hardiness Zones 4 to 8.